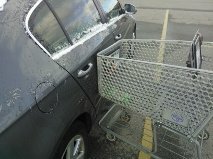 Return your shopping cart to the corral. Just. Do. It. Look at this. Do not avert your gaze. This. This is what greeted me when I came out of the grocery store today. It’s not about the car. It’s not about scratches and minor dents. I don’t care about these things. And that’s not because I abhor materialism (although I do abhor materialism), it’s primarily because I’m incredibly awkward and clumsy. Due to my clumsiness, all of my physical possessions will, probably within 45 minutes of their initial purchase, be broken, battered, bent, scratched, dented and/or otherwise ruined by me. I’ve had to adapt and grow accustomed to damaged goods, because I am so inclined to damage them. But, notice, I only damage MY OWN goods.